I have a knight in shining armour for a husband... the kind of guy who will lay down his coat to cover a puddle you’re about to walk on, except in my case this guy is the type who gives me his snazzy, new mobile phone to keep as my old one dies a slow and painful death, only to go and buy himself the cheapest and nastiest phone on the market. Crazy? Crazy lovely I'd say! His excuse – “I want to live a more simplified life”... which translated into woman speak says = “I never quite understood the flash fandangled contraptions that this phone has and never bothered to read the instructions either”. Anyway, I know for sure that my outrageous display of love last week had something to do with his generous act... you never quite know what a string of crochet hearts will do to a mans heart. 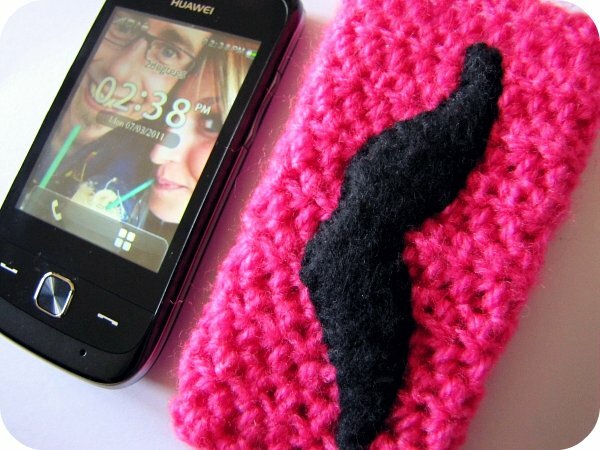 Oh – and check out the very cool pink crochet mustache phone cover I whipped up for my new phone. I love it!!! Love you too honey – and thanks. Your posts always make me smile big. I think I should be getting a heart crocheted banner for hubby's truck. Who knows what would happen?! I love it too!!! I think you should sell those on felt! Oh and whatta guy! sacrificial indeed! aww how lovely. That phone cover is crazy funny! love it. I wish I was more domestic, especially in the sewing category. I imagine it's a really useful skill, not only when it comes to make killer cell phone covers, but also for Halloween costumes and so forth. 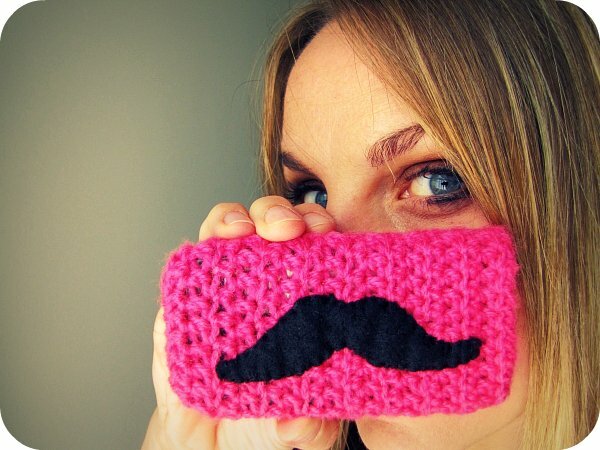 That is so adorable, especially that the mustache is on the hot pink background! Aren't you a lucky one, love the pink phone cover. you are such a nutbar!!! Maybe I should now 'thank' my sweets by making a heart-crocheted-banner for my love, I have a whole bunch of crocheted hearts somewhere piled up in the living room. Love you cover and awesome pics as usual!! Your photos always make me laugh! Fab idea! Cool, love hot pink anything. He he... I do believe you have a moustache, a girly moustache at that! Good for you. a hidden secret to men.....we woman all have mustaches...we just know how to care for it and prevent the folliciles from making a statement. Love the phone cover!!! what a lovely Hubby too! Have fun with your new phone! Awesome. Love your fun, happy projects and posts, so fantastic. Love that you make stuff for your hubby...they are often the forgotten ones. Thanks for the inspiration. Fantastic! Great post - thanks for the giggle! TOO funny! 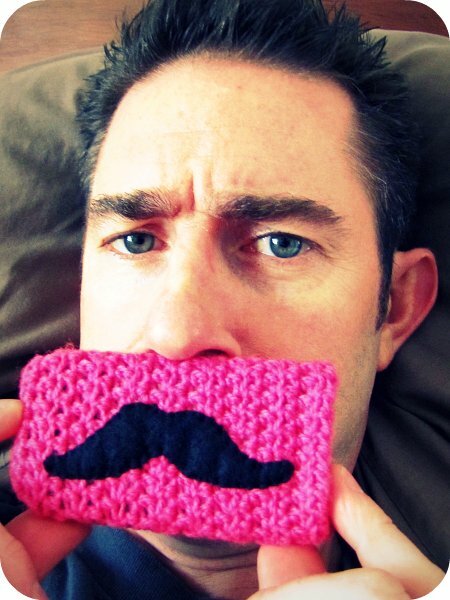 I can always tell your photos as I scroll through i-crochet....they are addictingly (is that a word?) cute!